In the summer of 2014, I studied abroad in Innsbruck, Austria. It was with a program with St. Mary’s University Law School. We were there for a month, taking classes with our own professors and one from Innsbruck’s university, and exploring the city in the evenings. With only a four-day class schedule, we were encouraged to explore neighboring cities and countries on the weekend. 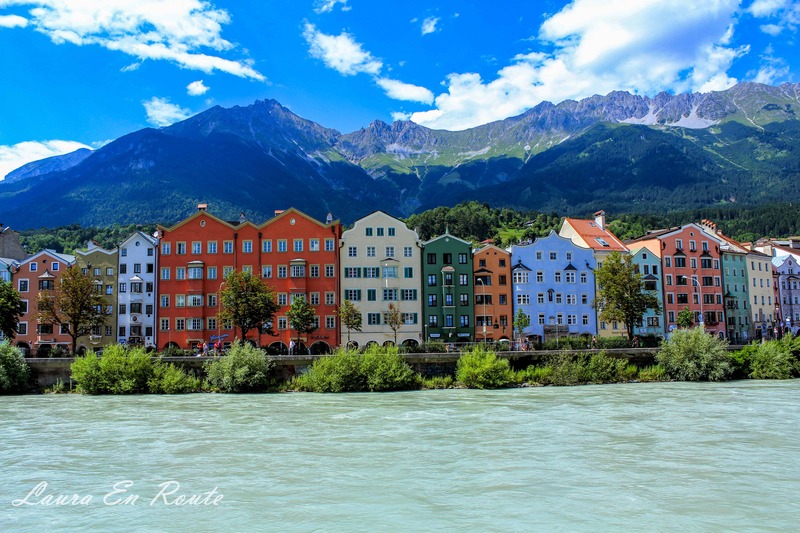 If you’re ever planning a trip to Austria, add Innsbruck to your list of cities to visit. Innsbruck’s charm and beauty will secure it a place in your heart. Innsbruck is the Capital of Tyrol. (You’ll notice a difference in spelling throughout the post. Both Tirol and Tyrol are correct spellings for the region). Innsbruck hosted the Winter Olympics in 1964 and 1967. You can still see the Olympic Rings near the Bergisel Ski Jump. Since I went in summer, I can’t say much on the winter sports available, but I did visit neighboring ski towns. The beautiful city is tucked away in the Alps and offers a wide array of things to do all year round. 1) When visiting Innsbruck, consider getting the Innsbruck Card. Another student and I stayed in Innsbruck one weekend instead of going to another country (way to save some money) and purchased this card. I mostly used it for “free” entrance to the museums. It happened to rain the one weekend we decided to stay, so museums were one of the main things we could do. We had planned to go to Lansersee (see below), and the card could have provided a discount on public transportation to the neighboring village. 2) Speaking of public transportation, Innsbruck has a great system of buses and trams. You can purchase tickets or passes from any Tabak (tobacconist) shop. Since we were there for a month, most students purchased a month-long pass for the tram. There was a stop outside of our hostel, across the river from the University and Old Town, and had stops in front of the University, at Maria-Theresien-Strasse, Old Town, and the Train Station. The trams were clean, not overly crowded, and had free-wifi. I’d only use buses to get to the villages outside of the city. 3) In 2014, cash was still king in Innsbruck. Grocery stores, however, preferred credit/debit cards with a chip. The chip was still new to U.S. credit cards (mine didn’t arrive in the mail early enough for my trip) so, much to my chagrin, I had to use cash at stores. Restaurants almost exclusively accepted cash. There are plenty of ATMs and Banks around town, though. I usually stopped inside the bank across from the University and took out a large amount at once. 4) Austria speaks German. Although the majority of people we encountered could speak English, they seemed less willing to speak English to the tourists. I don’t expect people in other countries to speak the same language as me, so it wasn’t a big deal to me. But, it also seemed like they’d pretend to not understand you when you spoke German. There were times when I know I was saying a word correctly but I was treated as though I was speaking gibberish. So other than that, and acting noticeable annoyed at my use of cash at grocery stores, the people in Innsbruck were very friendly. This is the main street running through Town Square (across the road from Old Town). You’ll find several restaurants, souvenir shops, and other stores. See below for information on an Irish Pub on this street. At the end of the street is the shopping mall. Its on this street where you’ll find the heavily photographed Annasäule, a column topped with the Virgin Mary. The Annasäule (St. Anne’s Column) was erected in 1703, on St. Anne’s Day, in the center of Maria-Theresien-Strasse to commemorate the liberation of Tyrol from the Bavarian troops. The column is made of red marble, which is fitting for such a colorful city, and topped with a statue of St. Mary. The column is surrounded by Saints Kassian, Vigilius, George and Anne. In the heart of Old Town is the striking roof top of the building known as the Neuhof. Decorated with fire-gilded copper tiles, original from around 1500, this Golden Roof is a landmark all on its own. Emperor Maximilian I added the 2,738 gold-plated copper tiles to the building in honor of his wedding. He would stand on the balcony to watch festivals and other events in the square below. Today, you can go inside and learn about the history of the building and roof in the Golden Roof Museum. There is a side entrance to the museum on Pfarrgasse. Down the street, is the City Tower. Although tall enough to offer a 360˚ view of the City, its easy to forget the tower exists until you’re looking up beyond the buildings on the square. The entrance to the tower is a bit elusive. The tower’s facade is along the street, but the entrance to the stairs is tucked between two buildings and down a small alley. The ticket office isn’t on the ground floor either (if I remember correctly). Just follow the sign on the wall “Zum Turm“. The stairwell is small and there’s not a lot of room at the top, so keep that in mind. But you get a great view of the city. There was a band playing in the square by the time we reached the top. We had a bird’s-eye view of the performance as they played for a large crowd that gathered and then follow them as they marched down towards Maria-Theresien-Strasse. The platform isn’t at the very top of the tower. It’s actually right above the clock. But you’re still high enough to be above the roof tops and see out to the river. I visited the tower on a rainy weekend when my roommate and I chose to be tourists in Innsbruck rather than travel to nearby city or country. Our view was cloudy, but beautiful nonetheless. The Swarovski store is located in Old Town. There are tours for Swarovski as well. I’m not a big jewelry or crystal person (nor could I afford it even if I were) so I never even looked in the windows. The store was always busy. It’s the largest Swarovski store in the world and has unique displays of its crystals throughout the 15th century-old building. To find out more about the store, click here. The Imperial Palace, completed by Emperor Maximilian I, is located almost on the outskirts of Old Town and known as the Hofburg Palace. Princess Maria Theresa (of the Habsburgs) visited the palace in the 1700’s and had the building restyled to fit modern times. Unfortunately, I never made it inside. Pretty sure I thought it was some governmental building and it was off limits to tourists…I was wrong. There’s a museum inside. Occasionally, there are also concerts in the courtyard. I passed by once when people were setting up the chairs and a stage. For some more history about the palace, check out this website. Located on the north side of Old Town, beyond the Golden Roof, and close to the Inn River is St. Jacob’s Church (The Dom). It is also knows as St. James Cathedral, erected by the Catholic Church in honor of the apostle. The outside may not look very impressive, but the inside is extremely ornate. Since its a relatively small church, it doesn’t take much time to walk around inside. The church dates back as far as 1180. It was rebuilt in the early 1700’s after it was badly damaged by several earthquakes in the 16th and 17th century. The strikingly colorful organ is relatively new. There has been two others but both were either damaged or moved. The organ on display now was installed after WWII had as also undergone restoration. The interior of the church displays several frescos, red marble similar to that on St. Anne’s Column, and a painting of Madonna and Child known as “Maria Hilf”. If you’re there at noon, you can listen to the church bells ring. To find out more about Innsbruck’s Cathedral, click here. There’s also a small park outside the church in the Cathedral Square (Domplatz) with a fountain and benches. It’s a great spot to relax, eat gelato, or plan your next stop. Be sure to check out the recommended restaurants below for information on the Cafe nearby. This church is next door to the Popular Art Museum, off of Universitätsstraße. During my weekend in Innsbruck, I went into the Volkskunst Museum (see below), without any clue that the Church would be at the end of our tour. When walking through the museum you walk down a corridor overlooking the museum. It was a pleasant surprise. Also known as the Court Church, this small church houses the empty tomb of Emperor Maximilian I. The tomb is guarded by 28 bronze statutes. He wished for 40 grand statues, but those were never completed. Among the statues, are some members of the Emperor’s family, including his two wives. The detail on these statues is astounding. There are several museums in Innsbruck, some more fascinating than others. But art is in the eye of the beholder, so pick which ever ones interest you, whether it be Modern Art, Historical Pieces, or Heritage. I experienced them all one rainy weekend. The Tyrolean State Museum is located on Museumstraße. Not to be confused with the Tyrolean Museum of Popular Art which is located off of Universitätsstraße. The State Museum is your more traditional museum with paintings and items from archaeological digs. For example, there is a Dutch collection including works by Brueghel and Rembrandt. The Tyrolean Pop Art Museum is located off of Universitätsstraße. To see this museum, you’ll enter the State Museum. As you make your way through the building you’ll find yourself in the Volkskunst museum. You’ll know when you’ve entered once you start seeing more modern art. The Heritage Museum (Folk Art Museum) displays life in Tyrol with mannequins, examples of historical rooms, articles of clothing, furniture, etc. You may also see this museum being called the Landesmuseum. I wasn’t confused about the museum names and locations until I started researching them for this blog post. I think because most of them are connected in the same building. This is why I have provided photos of the buildings to help you locate the correct one. It’d be a good museum if you have children (or adults who like taking pictures with things). I matched the mannequin. Outside of Old Town, towards the Bergesi, is the Kaiser Jäger Museum and Panorama (housed in a separate building). These museums, located on the side of the mountains, offer stunning views of Innsbruck. The museum is built on the spot where a battle between Napoleonic troops and the Tyrolean rebels (led by Andreas Hofer) took place in 1809. It is this battle that is depicted in the Panorama. The Kaiser Jäger explores the military history of the 18th and 19th century in the region. There are uniforms, weapons, flags, and paintings on display. Across from the Kaiser Jäger is where the Panorama of Tirol is located. There is also an underground tunnel connecting the two museums. The 360˚ painting depicting the battle of Bergisel is located downstairs. On the ground floor is the “Europe Room”. It’s an interactive museum with interesting historical pieces from the region (like hiking gear and snow shoes). There’s also a cafe on site where you can grab lunch, dessert, or coffee. Its a great spot to rest after walking (especially if you walked up the hill from the bus station) and take in the view. While in this area, consider hiking the Panorama Loop Trail. See more information on this hike at my post Hiking Around Innsbruck. Ambras Castle is located outside of Old Town Innsbruck. Our professors arranged a dinner at the Castle and a private tour of parts of the museum. We were free to roam the majority of the grounds, but not the inside of the castle, with the exception of the museums. One of the exhibits we are able to view was the Chambers of Amour collection. The collection displays “rare suits of tournament armor, ornamental armor for courtly ceremonies, the armor of famous military commanders” and armor belonging to Ferdinand II. I took a picture with the “Knech tharny of the Hofriesen Bon and 3 boy armor” display to show the sizes of the different armor. I’m 5’7″. The doll wearing the large armor is supposed to be the Italian farmer, Bartlmä Bon from Riva. He was a companion of the Archduke. You can also find his portrait in the portrait gallery. The smaller armor belonged to the Archduke’s children. Archduke Ferdinand II, a known collector of art, established the museums inside the castle to display his many collections. In addition to the armor, there is a portrait gallery, established in the 20th century, which we didn’t have the chance to view. One wing of the museum we did have a chance to peruse is the Arts and Curiosities collection. Below are pictures of some of the pieces. The first photo on the left is of a “cabinet” which would have been used to store coins and jewelry. The middle is a photo of a Glass Bells Piano (Glasglockenklavier) dating back to 1596. The front of the keyboard displays the coat of arms of Archduke Ferdinand II, flanked by Minerva and Mars. The last photo, on the right, displays the Holy Grave. Its a German design dating back to the 16th century. In the background is a writing utensil dating back to the late 16th century. The ornately carved top is removable and the inside would store wooden chisels. To find out more about visiting the castle, visit its website here. Situated near the St. Jakob Cathedral (the Dom) is this very swanky bar/cafe. The interior of the Dom Cafe Bar is enoughreason to stop in for a drink. The Stiftskeller was our professor’s favorite restaurant. We ate here on several occasions. If we had a large group, this was the best place to find a table. It’s also were we stopped for a beer after hiking. And if we just didn’t know where else to go, we knew we could rely on a good meal here. There are two entrances. Entrance to the patio (photographed) is located along Burggraben. Entrance to indoor seating is on the opposite side of the building along Hofgasse and Stiftgasse. I only went to this restaurant at night. And at that time of night it was a bar/dance club. There is a summer study abroad program with some U.S. universities (not associated with our Law School program) in Austria. We would see American students a lot when we were headed to class in the morning. So when we heard from locals that Hofgarten is where a lot of locals went at night, and American undergrads, we decided we had to check it out. For locals, the undergrads were a source of entertainment. And it was obvious why…one very drunk guy got kicked out for hanging from a patio umbrella…I encourage you to check it out when its not overrun by undergrads. Its in the middle of the park so it should be a very nice place to eat during the day. If you’re in the mood for gelato, head to Burggraben. It’s down the street from the Stiftskellar, making it the perfect destination for a light dessert, and there’s plenty of patio seating. If you’re looking for good beer and a traditional pub setting, head to this Irish Pub on Maria-Theresien-Strasse. When I was in Innsbruck, the World Cup was going on. It was a big deal in Austria since the German team was in the finals. I hadn’t watched soccer game since I was in high school and it was impossible not to watch the game that summer. There were screenings at the Marktplatz and pubs all around town. We watched one game at the Irish Pub with several locals. It was hard not to get excited in that kind of atmosphere. People lined up rows of chairs in the middle of the pub so they could see one of the small screens. The other place we watched a game at was Gastgarten Zur Eiche, recommended to us by one of the locals. This is one of our professors’ favorite Indian Restaurants in Innsbruck. A group of us went one evening to see if it lived up to his hype. It’s a very small restaurant with very kind employees. I’m not a big fan of spicy food (my taste buds just can’t handle it) but it really wasn’t spicy at all. In fact, it was very good. It’s a little out of the way if you’re staying around Old Town, but nothing in Innsbruck is too far of a walk. If you’re visiting the Tiroler Landesmuseum to see the Panorama or the Kaiser Jager Museum, this restaurant is located at the bottom of the hill. It’s a great spot to eat if you’ve got an appetite. With similar portions and menu to the Stiftskellar, this is a great spot to stop and relax with a good meal. This cafe is near the University, which made it a frequent stop for me. If I arrived early for class or needed a caffeine fix, this was where I stopped. For more recommendations on things to do when visiting Innsbruck, check out my other posts on Hiking Around Innsbruck and Day Trips from Innsbruck.